Comments: The obverse shows a small undraped bust right Washington, within a circular wreath. The reverse displays the American shield with thirteen stars above and thirteen strips below (the two end strips are just visible). Atop the shield is an American eagle holding an olive branch in its talons and a banner with the national motto in its beak. Note the E is missing from E PLURIBUS UNUM. This undated storecard was probably produced in 1863 (the year most of the Civil War storecards were produced in response to the government's withdrawal of metallic currency during 1862). It was issued in copper, brass and white metal. The Washington side was also issued without a legend (just the small central portrait) and is cataloged by Fuld as Civil War reverse die 1141. This variety is found in copper joined with the same Magnus American Eagle side shown above (Baker 557F or Fuld CWT 630AS 2a). Reference: Rulau and Fuld, p. 264; Fuld, U.S. Civil War Store Cards, 2nd ed., p. 261. 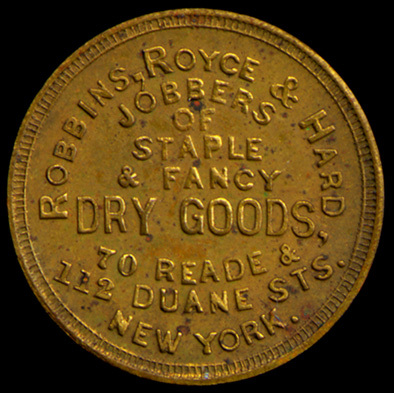 Reverse: ROBBINS, ROYCE & HARD / JOBBERS / OF / STAPLE / & FANCY / DRY GOODS, / 70 READE & / 112 DUANE STS. / NEW YORK. 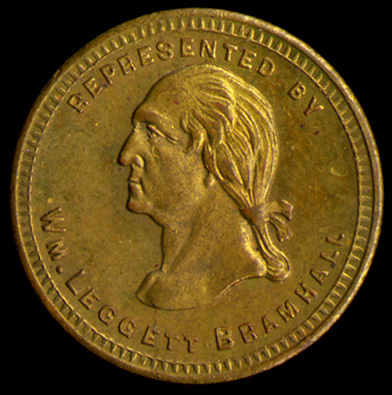 Comments: The obverse displays an undraped bust left portrait of Washington. This token was struck by George Hampden Lovett of New York City at the request of William Leggett Bramhall, who was the first curator of the American Numismatic Society. 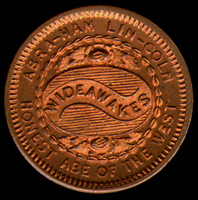 The obverse was first used in 1859 to strike about 300 storecards (Baker 568-568E). 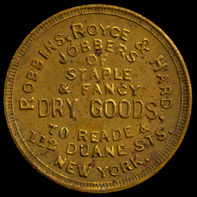 In the following year an additional supply was produced by with a modified legend, changing the wording WHOLESALE / DEALERS IN / DRY GOODS; to JOBBERS / OF / STAPLE / & FANCY / DRY GOODS, as on the example shown. 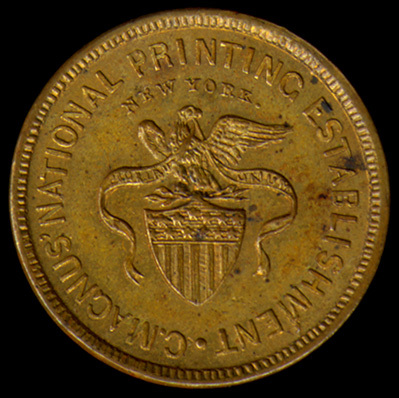 This token was produced in limited quantities in silver, copper, brass, nickel, copper-nickel and white metal. 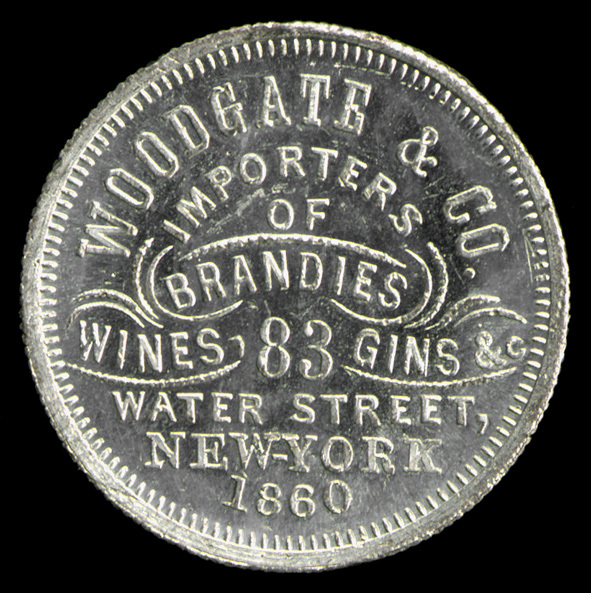 Twenty exapmples were made in silver, fifteen were struck in copper and brass and only six were produced in white metal; however several hundred were issued in nickel. 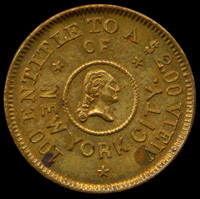 References: Rulau and Fuld, p. 265; Rulau, Standard Catalog of United States Tokens, 2nd ed., p. 254. Comments: The obverse displays an undraped bust left portrait of Washington. 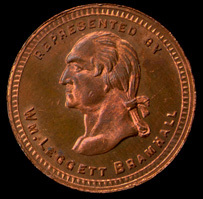 This token was struck by George Hampden Lovett of New York City at the request of William Leggett Bramhall, who was the first curator of the American Numismatic Society. 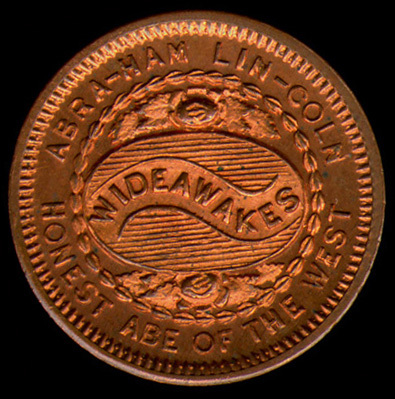 The obverse is the same as was used on the previous token (Baker 569B). The reverse is from the Lincoln medalet (DeWitt AL 1860-73) produced by Lovett shortly after May of 1860. It displays a circular wreath containing a design with a central banner carrying the legend WIDEAWAKES. This muled token is one of a group of mules using Robins, Royce & Hard storecard dies that were produced in limited quantities by George H. Lovett at the request of William Leggett Bramhall during the autumn of 1860. It is the only one in this series of mules with a Washington bust. The series is unlisted in Rulau but is mentioned on pp. 254-255 under Robins, Royce & Hard medallic cards. Three examples of this Washington mule were produced in silver and fifteen examples were issued in each of the following metals: copper, brass, copper-nickel and white metal. References: References: Rulau and Fuld, p. 265; Rulau, Standard Catalog of United States Tokens, 2nd ed., pp. 254-255. Comments: The obverse was struck using the F.C. Key die depicting an undraped bust left of Washington within an arched frame. 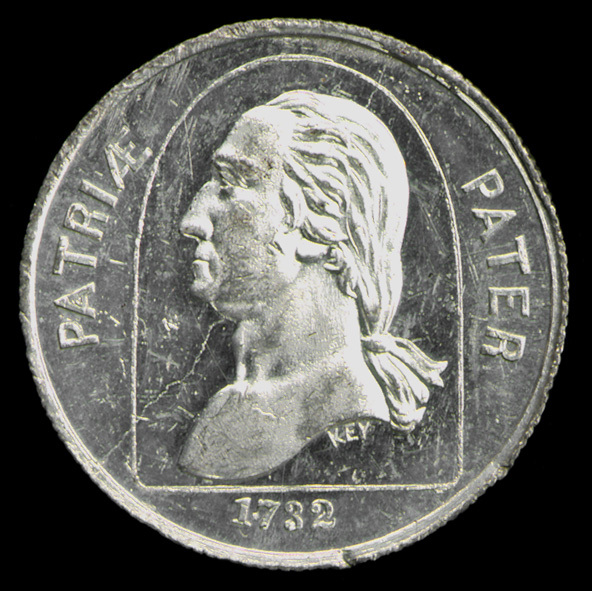 The Latin on the obverse, which is the opposite of the usual word order, translates as Father of the Country, while the date 1732, in exergue, is the year Washington was born. Note there is a die crack that travels from the bottom rim at about 7:00 o'clock up through Washington's throat, jawbone and hair to the rim at about 1:00 o'clock. The reverse is the 1860 Woodgate storecard which was originally issued with an obverse stating: REPREStd BY J.N.T. LEVICK (Miller NY 969-971). The Washington/Woodage mule was issued in silver, copper, brass and white metal. 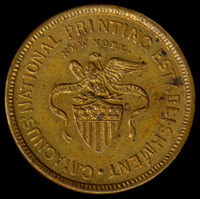 This is related to a group of muled Washington tokens and medals (Baker 211, 337 and 633-636) made in 1860 or soon thereafter by the New York City diemaker George H. Lovett using the Washington die of F.C. Key of Philadelphia. 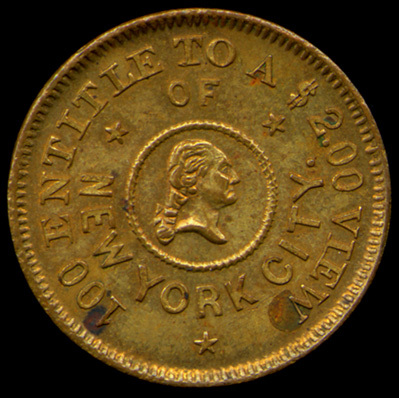 See the Washington muled token section for further details. It is generally though these mules were made at the request of the New York City tobacco merchant and token dealer Joseph N.T. Levick. Like most in this series the Woodgate storecard was muled with the Washington (Miller NY 972-974), Webster (Miller NY 975-977), Forrest (Miller NY 978-980), the smoker (Miller NY 981 and 983), cupid, (Miller NY 984-986) Key 123 Arch street storecard (Miller NY 987-989), KEY 329 arch street storecard (Miller NY 990-992), Levick's crossed pipes (Miller NY 993-995), and the VIRTUE, LIBERTY & INDEPENDENCE (Miller NY 996-999) dies. Also see the New York storecard of E. Hill (Baker 542C) on the previous page.